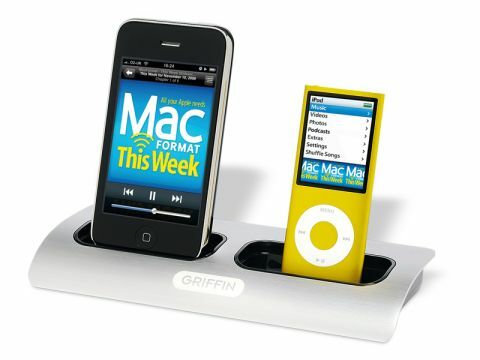 The Griffin PowerDock 2 looks to solve a very specific problem. That is, the need to charge two iPods, or one iPod and one iPhone, at the same time. The unit has been designed to be a hallway-table docking station and thus acts like one. There's no ability to sync with the PowerDock 2 – it is purely for charging your iPod or iPhone. The idea is, as far as we can tell, that after a hard day at the office, you come home, plonk your device into the PowerDock – next to your partner's or your other device – before picking your iPod or iPhone up in the morning, fully charged and ready to go. Sure, it's not a revolutionary idea, and it doesn't sync or indeed connect up to your Mac in any way whatsoever. It's supposed to sit somewhere convenient and act as a charging station. It looks nice with a stylish brushed aluminium finish, doesn't cost the earth at £25 and is actually pretty useful. It's also compatible (through supplied dock adaptors) with all but the most archaic iPods (basically those that charge by dock connector). You name it; iPod 20GB click-wheel, first-gen nano, iPod touch and of course the latest models. Early shipping units, which you may be unlucky enough to find, don't come with an iPhone 3G adaptor. It will cost you extra to get one. And if you need more than two charging docks, there's a four-dock model available for around £45. Yes, we would have liked a charge indicator on the unit and maybe an auxiliary port. But as it stands it does the job it was made for very well.